Doctor Who star Karen Gillan said she did not know whether she would be part of a third series of the show with co-star Matt Smith. The 22-year-old, who plays Amy Pond in the Doctor Who series, said she was “excited” about filming the second series with the 11th incarnation of the Timelord. The star was speaking as she signed boxes containing a five-inch version of her character along with posters for more than 200 fans at toy store Hamleys in Glasgow’s St Enoch Centre. But the star remained tight-lipped about the Christmas special and second series, which she is about to start filming. She said: “We are about to start in a week and a bit on the series, which is exciting. We’ve finished the Christmas special so that’s all in the can and it’s a good one. “It’s really funny but it’s also heartbreaking and you get a glimpse into Amy and Rory’s honeymoon, which is an interesting one. “There’s a really, really scary one (monster) in the Christmas special. “When I finish work filming in the evening we are learning lines for the next day. That’s what happens. I have like an hour in the evening to do what I want to do and I just watch TV and sit there. That’s not very exciting is it? “When they are setting up the lights and everything I might have a coffee. The most surreal thing is that it feels really normal now. That is normal life seeing, you know, lizards drinking coffee.” The actress said the new figure of Amy Pond was “pretty cool”. Speaking about the attention from photographers she said: “It doesn’t unnerve me. It’s part of the job, right, and that’s just the way the industry works and that’s something you have got to deal with. 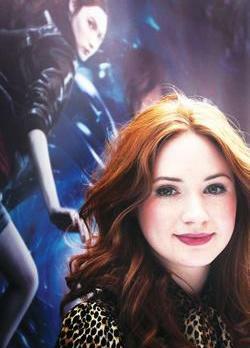 Ms Gillan said Amy Pond was one of the most interesting characters she had played in her career so far. She said: “I think that she’s a completely different person at the end of the first series to when we meet her. “I mean, she has been through a lot in the series. It’s been pretty emotionally draining. All the stuff where she’s crying and she doesn’t know why she’s crying, that was quite a challenge. Meanwhile Doctor Who star Karen Gillan said she wanted to be in an episode of The Simpsons.